What It Is Lawn Aeration? Why, When and How It's Done? The basic idea behind lawn aeration is that, like you, your lawn and the soil under it need to breathe. But how do you accomplish this? And when should you aerate your grass? These are issues I address in this article. Providing much-needed lawn aeration for your grass entails dealing with thatch -- which, along with compacted soil (see below), lies at the heart of the matter. The build-up of lawn thatch makes it difficult for your lawn to breathe. Lawn aeration performed in spring or fall helps control lawn thatch. 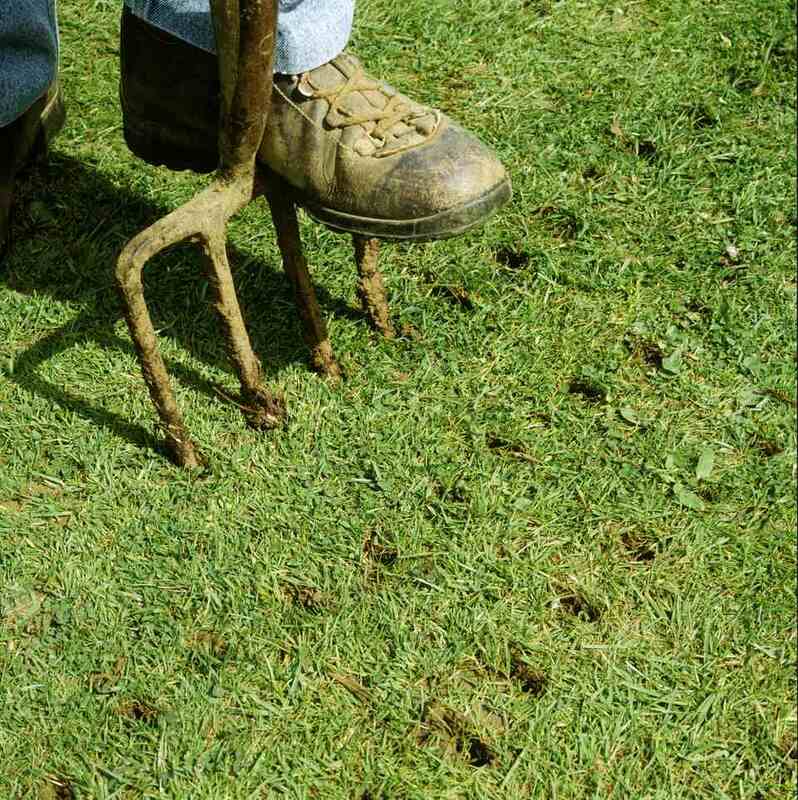 The process of lawn aeration (sometimes misspelled as "airation") can be as simple as poking holes in the soil here and there (so-called "spiking"), but this would work only for superficial cases. For those in greater need of lawn aeration, this haphazard approach will not be sufficient: you will need to perform core aeration. You should also faithfully remove as much lawn thatch as you can in fall by raking deeply, rather than just skimming the autumn leaves off the top of the lawn. Lawn aeration also breaks up compacted soil, allowing water and fertilizer to permeate into the root zone. Grassy areas submitted to constant foot traffic (or, worse, car traffic) require lawn aeration more frequently than do out-of-the-way areas. Lawn aeration may be undertaken in the spring for warm-season grasses, as soon as the soil has thawed. I mentioned examples of warm-season grasses in a prior FAQ, such as Bermudagrass. But for Northern lawns planted with cool-season grasses (such as Kentucky bluegrass), some experts say the fall season is better suited to core aeration. I suppose their reasoning is that core aeration and overseeding are sometimes done together, and the latter is more effective in the North in fall than in spring. But in a more general sense, either spring or fall is fine for the operation. I recommend going to a rental center to rent a piece of equipment especially for core aeration, called the "lawn aerator." Since you should not need to aerate your lawn very frequently, it would not make sense to own the equipment outright. Some experts advise you to aerate a lawn once every five years, while others suggest doing it only on an as-needed basis (that is, in response to warning signs you detect in your lawn, such as puddling after a rainstorm -- an indication that the soil under your grass is compacted). This lawn aeration equipment will pull plugs, or "cores" (thus the name) of soil out of the ground, letting air in. These plugs should be 2-3 inches in depth. Such a plug should be pulled out of the lawn at about every 3 inches. The plug removal process is facilitated by watering the lawn the day before, but don't water to the point of muddying the soil. Likewise, if your thatch problem is severe (say, 3/4 inch thick or more), rent a vertical mower from a rental center. Alternatively, hire a lawn service to do the job of lawn aeration for you. For more on dethatching, please consult this information on raking leaves. What Is Dethatching and Why Is It Important to a Lawn?